Forming after the devastating 2010 earthquake in Haiti, Lakou Mizik have been traveling around the globe to spread their message of togetherness, good spirits and over-coming troubled times to the rest of the world. The Haitian music troupe hailing from Port-au-Prince graced the main stage at Edmonton Folk Festival for the first time, debuting their unique, time-honoured and homegrown sound to an eager and curious crowd. 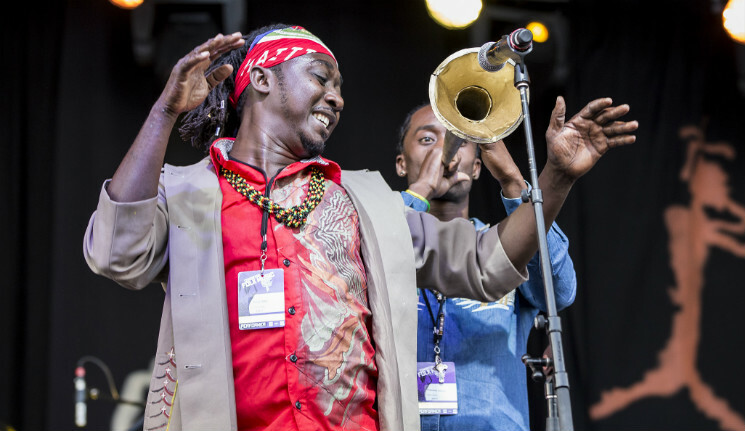 The massive nine-piece group is anchored by the powerful voice of Sanba Zao, but it's the emphasis on horns that gives the group their traditional Haitian Rara sound. The high energy of the members onstage was both engaging and enticing as they encouraged everyone in the audience to join them in dance — and many were happy to oblige. Multiple times, Lakou Mizik addressed the audience with messages of love and well-being, before breaking back into song without a moment's notice. Guitarist Steeve Valcourt was hard to miss as he asserted himself onstage, contributing to the band's jazzy direction in parts of their set and helping to distinguish different songs. At times, the free-flowing set blended each song into the next, making the whole performance feel like one massive song. Though they got to finish their set, Lakou Mizik wasn't the only thing blowing the audience away; the group would be the final performance of the day as a massive windstorm moved into the festival, causing an early and unexpected end to the day's performances and moving Shakey Graves' anticipated set into a different venue.